We are slowly making our way through the suckling pig. On Friday I pulled out one of the shoulders to cure. Thyme, sage, and juniper are traditional additions to the brine, but for a change of pace I used coriander, orange zest, and a little cumin instead. Sunday morning, I washed the shoulder, deboned it, and pan roasted a 1 lb. piece for breakfast. You might remember from the Cracklings! post, that this has become our favorite cooking method for small portions of suckling pig. There was a pretty thick layer of fat, so I let it render, skin-side down in the saute pan over medium-low heat until it got really brown and crisp. Then I flipped it and popped it in the oven at 400°F to finish cooking (about 8-12 minutes). 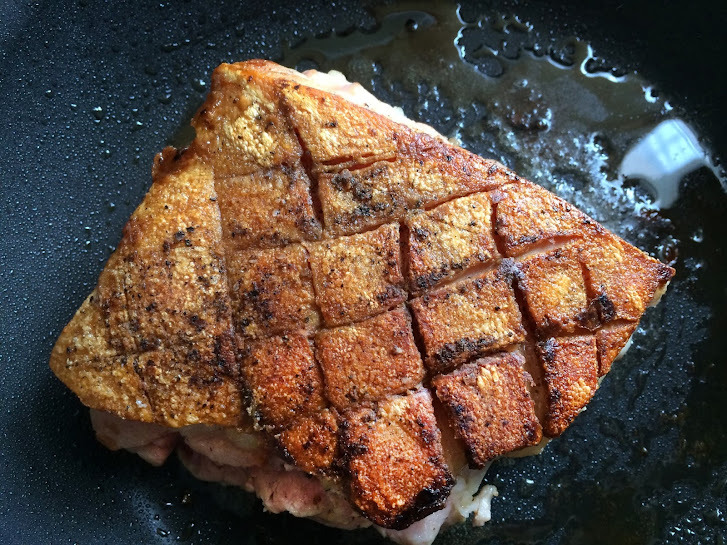 The ham was salty, sweet and tender, and had a nice citrus finish from the orange zest and coriander. Plus, I’m totally addicted to that crispy skin! 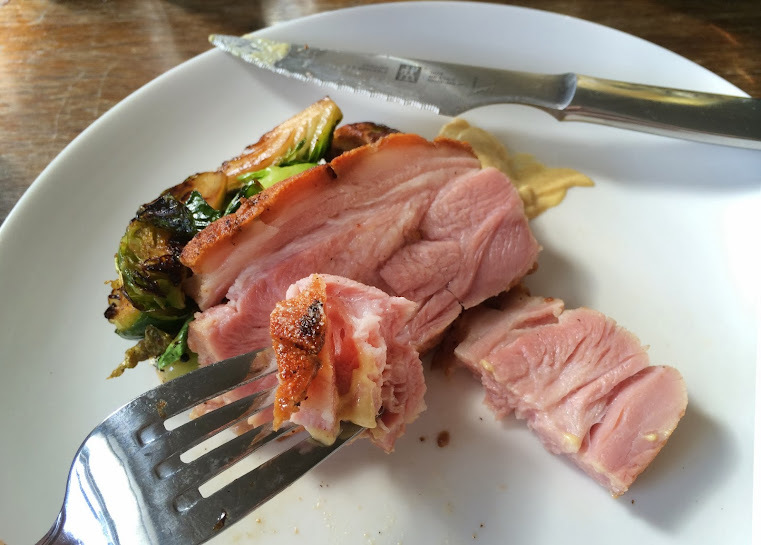 Since D. and I have been on Atkins we’ve gotten pretty tired of eggs, so we had the ham with a little dijon mustard and roasted brussels sprouts instead. Here is a basic brine for curing just about anything from a ham, to turkey breast, or beef brisket. Curing time will vary according to the the type of meat, its weight, and thickness. A 4-5 lb. pork loin will take 48-60 hours. A 3 lb. turkey breast may only take 36-48 hours. A beef brisket will take longer, 5-7 days. If the meat cures too long, there is a chance it will be too salty. But if the cure does not have enough time to penetrate to the center of the roast, you will notice discoloration in the middle, but only after you have cooked it. This is because the sodium nitrate in the curing salt turns the meat pink when it is cooked. Any uncured parts will turn white or grey, and will not be fully preserved. Curing salt is inexpensive and available from a number of sources online, including Amazon.com. If you know a friendly artisanal butcher who makes house cured meats and pates, he will probably be happy to sell you some and maybe even give you some pointers. For pork or turkey, you might include 3-4 cloves of smashed garlic, a bunch of thyme, sage, and/ or rosemary, a Tbsp. of juniper berries or black peppercorns. For brisket, you might add coriander seed, mustard seed, bay leaves, and crushed red pepper. I also like to add an onion, garlic, and a cinnamon stick. Combine water and all the remaining ingredients in a stainless steel saucepan or stock pot. Bring the mixture to a boil and turn off immediately to prevent the water from evaporating. Cool the brine completely in an ice bath, or by dividing the liquid into smaller containers in the refigerator. If you will be brining a large roast like pork shoulder or brisket, use a metal skewer or a knife with a long narrow blade, such as a boning knife, to stab the meat in several places. This is to help the brine enter the thickest parts. Once the liquid has cooled to 41°F, submerge the pork completely in the liquid, using a plate or other object to weigh it down. Cure, refrigerated for 48-60 hours. After the meat is cured, make sure to rinse it to remove any excess salt before cooking. Cook the roast as desired. Instead of cooking the entire roast at once, you might cut it up and freeze smaller portions, tightly wrapped until you need them. Tags: Atkins, Brine, Cooking, Cracklings, Food, Ham, Suckling Pig. Bookmark the permalink.